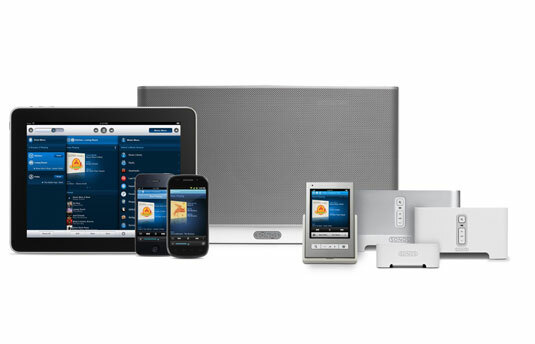 Sonos is a music system that lets you stream Spotify music to several rooms of the house. Locally stored tracks can be streamed, as can tracks from online radio stations and streaming music services such as — you guessed it — Spotify. Each room could be playing a different Spotify track at the same time, streamed from the same Premium account! This is an exception to the usual Spotify restriction that forbids you to play music from more than one device at the same time. You use a touch-screen remote to control what’s being heard from the speakers in each zone (volume can also be adjusted for each room). Sonos has also released iPhone, Android, and iPad apps that let you use those devices as a remote, instead. One limitation is that you can’t currently modify or share playlists by using the Sonos controller. You need to do this kind of playlist work on the Spotify desktop app. Any playlist changes are then updated on the controller. Should you run into any connection problems, they’re likely caused by a firewall issue, and some basic configuration may be required. Access Sonos Customer Help for assistance (search for Spotify to get started).